Brexit has (sort of) made me an internationally exhibited artist. Cool, huh? I blogged recently about the anti-Brexit / pro-European Facebook page I run that had reached 1.4 million people in a month (it’s has since ticked up to 1.5 million). Well, a month or two ago a message came in via the page from a curator at Kunsthal Charlottenborg, in Copenhagen, asking for any anti-Brexit placards we had from the London marches. It was for an exhibition, Europa Endlos, that is now open here in the Danish capital. Thankfully, in my brief Marie Kondo-inspired brush with decluttering I had spared the various placards that my partner and I had created and accumulated over the course of attending something like half-a-dozen anti-Brexit marches. So, these placards were packed off to Denmark and on Friday, I visited them in the exhibition! How cool is that? And what better way to mark 29 March 2019 – the day on which we *aren’t* leaving the EU – than to visit one’s own anti-Brexit placards on display as part of an exhibition about European identity? Seeing them there – smudged, stained and scuffed by being carried for hours – reminded me how fantastic it had been to march with so many other committed pro-Europeans. It made all the efforts to bring together friends, family and work colleagues on the marches so worthwhile. I was touched, actually, that the effort we are all making to fight Brexit is being seen and appreciated by our fellow Europeans. And what I found refreshing about the exhibition, which marks not only Brexit but May’s elections to the European Parliament, is the way in which it takes those European elections and the issues at stake in them seriously. The exhibition deals with themes like identity, labour, borders, community and migration. When has a European election in the UK ever had this kind of treatment? A little over three years ago, just as Cameron named the date for the 2016 Europe referendum, I set up a Facebook page as a place to … well, I wasn’t sure, to be honest … however, I knew I wanted to campaign online as well as face-to-face. I threw myself into that referendum campaign. I did plenty of street campaigning right across the South West, speaking with voters in places like Truro, St Austell, Liskeard and Plymouth as well as Taunton, Stroud, Bristol and Bournemouth. Also when I wasn’t shuttling between high streets wearing the uniform of the time – an “I’m IN” T-shirt is worn tightly and awkwardly over all one’s other clothes – I was populating that Facebook page with news, links that helped willing volunteers to find local campaign opportunities, and a whole host of other things. Moreover, that has never stopped. Now, three years later, the Campaign to Remain – keep Britain in Europe Facebook page is a community of over 55,000 people. In the last four weeks alone the page’s posts have reached 1.4 million people and generated 1.3 million engagements – that’s likes, comments, clicks on links, etc. The top post alone has been seen by 135,300 people and generated 49,900 engagements. EU citizenship post-Brexit: one step closer? Guy Verhofstadt is a hero in our unheroic age. Whilst confusion and fear over Brexit stalk the lives of many, Theresa May hides behind the camouflage of providing “no running commentary” – helpful cover for a government with no plan and no idea – and European Commission chief negotiator Michel Barnier understandably asserts that he cannot negotiate a British exit from the EU until Britain confirms it actually wants to exit the EU. Into this vacuum steps Guy Verhofstadt, the Belgian MEP and former prime minister who heads the Liberal group in the European Parliament. Relatively quietly, it is Guy who has put the first concrete proposal onto the exit talks agenda: opt-in EU citizenship post-Brexit for Brits who want it. It is something I have been making a pitch for here and elsewhere for the last couple of months, including two articles (here and here) in The New European newspaper. In the last few days, Guy has made this commitment: “I, as Brexit negotiator for the Parliament, will ensure that it is included in the Parliament’s negotiating mandate.” With a single, decisive act, he has done more to include Britain’s pro-Europeans in the Brexit process than our own government has attempted in six months. It has come sooner than we might have thought. But the first crunch parliamentary vote on Brexit is about to take place. Not in Westminster, but 200 miles to the east, in Brussels. And the British press is waking up to it. Splashed across the front page of Saturday’s edition of The Times is the news that Guy Verhofstadt, the Belgian MEP who leads the Liberal group in the European Parliament, backs the idea of offering EU citizenship directly to Brits who want it post-Brexit. The Guardian and others have reported on it too (if you don’t have access through the paywall). I first blogged about this idea last month, and wrote about it here in Lib Dem Voice earlier this month after learning that another Liberal MEP, Luxembourg’s Charles Goerens, had started to push for it. Brexit might not yet happen, but on 8 December MEPs on the Parliament’s Constitutional Affairs Committee will cast the first votes on whether Brits might be able to opt back in to the EU as individuals in the event that it does. Since the vote to leave the European Union back in June, many of my friends have suddenly developed a keen interest in their Irish ancestry. Others have already bagged a German passport, a Cypriot passport, and permanent residency in Belgium. Everywhere, anyone with a parent or grandparent from elsewhere in Europe is clambering aboard a lifeboat out of Brexit Britain. Some of us however aren’t able to contribute to the big, post-referendum spike in applications to become new Danes, Italians and Swedes. I was giving this a lot of thought last month. Sure, I want to keep my right to live, work, travel, study, retire, even start a business across the EU with the minimum of bureaucratic fuss and bother, but it’s more than that. I am a European. I feel it in my bones. I don’t want my EU citizenship ripped from my hands. I want to keep it. A thought popped into my head. A solution that would allow those who wanted to leave to do so, whilst allowing those who feel they are EU citizens as much as British citizens to remain. Whenever I’ve tired during this long referendum campaign I’ve thought about how I will feel as I watch the results come in during the small hours of 24th June. Fear of losing, especially if not by much, has driven me to throw myself into the campaign. And one of the benefits of a truly national election is that there are no safe seats or swing seats. Every vote genuinely counts as much as any other. It’s given me the freedom to get out and about as I campaign. It means that last weekend I was in Bournemouth, the week before in Liskeard, and this Saturday I’ll be at home in Plymouth (feel free to come along). I wanted to do even more though, so my partner and I set up a Facebook group as somewhere to try out ideas and see if anyone thought they were any good. We called it Campaign to Remain – keep Britain in Europe. We didn’t expect much. At first we thought it would be a niche little thing where we’d be breaking open the champagne if a post ever got over 10 likes. But we’ve been really lucky. What has Europe ever done for me? It’s a question that the impending referendum has caused me to ask myself. I had always been supportive, but throwing myself into the campaign to remain meant I needed to be clear in my mind why I was supportive and what the benefits were. And having helped so far at street stalls in Truro, Plymouth, Taunton, Yeovil, Bristol and Stroud, it has proved a useful exercise as voters have rightly demanded to know what good the EU has done. And the way I thought about it was to think about the generations of my own family. How have their lives been different because the EU exists and because we’re in? Take my father, for example. He was a Royal Marine in the Sixties and Seventies. My brother too served in the armed forces, in the Eighties and Nineties, and his daughter – my niece – too. And my brother-in-law is a serviceman today and has been so for about 20 years. All of them have seen active service, but none of them thankfully were thrown into a conflict on the European mainland. Indeed, in the case of my father and brother, they once stood ready to defend our country from communist dictatorships in eastern Europe that are today our democratic friends and allies. It is true that Nato helped prevent war between the West and the East during the Cold War, and stands ready to defend us today should Putin get a bit too trigger-happy. But there is a difference between an absence of war and a culture of peace. And it has been the European Union that has made it the boring, day-to-day norm that European countries talk with each other and work with each other on the big issues facing our continent. And it was the pull of EU membership, not the defensive military alliance of Nato, that helped embed democratic government and civil liberties in those eastern Europe countries that joined the EU a decade or so ago. Nigel Farage told the media last year, “I am saying that if we have an Australian-style points system, immigration would not be a problem.” He made the point again earlier this month, speaking to Sky News. Well, I’m on holiday in Australia this week, and I’ve been reading the papers. And one thing I can definitely say is that an Australian-style points system is no silver bullet when it comes to immigration. Anti-Europeans struggle when it comes to numbers. UKIP can’t decide whether it’s thousands, tens of millions or hundreds of millions of foreign nationals who are descending on Britain. Business for Britain’s boast that Brexit would make each of us £1.06 per day better off falls apart even under the mildest of scrutiny. And only last week Tory MP Sir Nicholas Soames highlighted the £14bn black hole in Vote Leave’s back-of-an-envelope calculations. But the clumsiness of Business for Britain and Vote Leave is as nothing compared to Leave.eu. If we pull out of Europe, Leave.eu’s chief executive Liz Bilney told Sky News, “we will be better off by £1,000 per person.” She then clarified exactly what she meant: “That’s real money in people’s pockets that they’d be getting back”. Inside the EU we have better access to the European marketplace than we could ever have outside. And the clout of such a massive bloc means we strike better trade deals now than we ever could on our own. For years anti-Europeans have churned out stories about Brussels banning schoolchildren from eating yoghurt and the Queen from appearing on our passports. More recently they latched onto immigration, with Brexiteers offering up conflicting numbers of how many millions of foreigners are on their way. With the referendum approaching however the time has come for them to stop complaining and start explaining. What assurances can they give, for instance, to people in Swindon who earn a living building cars for Honda? How secure are their jobs going to be if trade barriers go back up? Europe or the world? It’s a false choice. “Do you agree that the UK should leave the EU and trade with the world?” That’s the question on the front page of the UKIP website, and presumably how they want to start framing the referendum debate once they launch their own No campaign later this week. 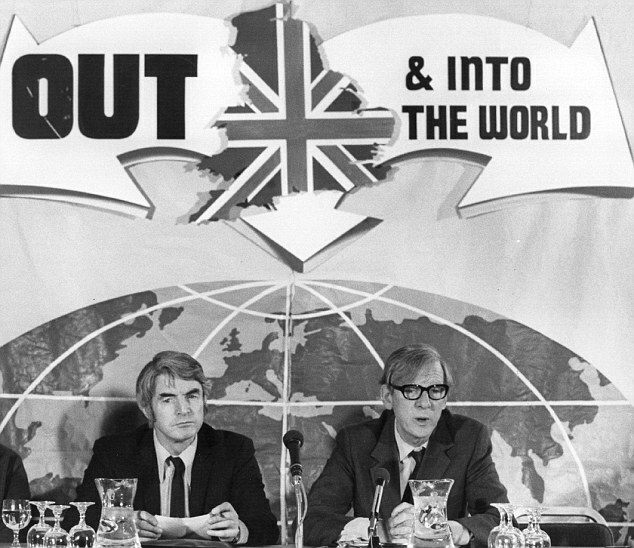 “Out, and into the world,” as it was put in the 1970s. But that’s a false choice. We don’t have to choose between Europe and the world. We can have both. Let’s start by emphasising just how important the European marketplace is to British business. Last year, according to figures from the Office for National Statistics, the UK’s exports to the rest of the EU were worth £226bn – 12 times the value of the stuff we sold to China and 33 times what we sold to India. Between 2000 and 2014 the value of our exports to the rest of the EU rose by £80bn; the value of our exports to China rose by £16bn, and to India by just £4bn. China and India are important, growing markets with lots of potential, but let’s not forget just how important Europe is and will remain. Leaving the European Union would be a big deal. It would mean slamming on the brakes, crunching the gears and setting out on a new course, and, in the run-up to the EU referendum, the No campaign will argue that we should do just that. They want us to break with the past and follow a new path. So, what would a No victory mean for the future direction of Britain? The full report is here, but let me summarise it for you. A Hungarian journalist living in Hungary – and working for the paper – lied and used a forged tenancy agreement to obtain a UK-issued European Health Insurance Card (EHIC), to which she had no legal entitlement. An EHIC allows residents of certain European countries to obtain emergency medical treatment when visiting other European countries. The journalist then visited health providers in Hungary to confirm that they accepted the EHIC. She states in the paper that she did not use the card to obtain any care, but if she had done so the authorities in Hungary would have been entitled to claim the cost of that care back from the UK Government. Cue outrage at soft touch Britain, etc. Did late postal votes cost Labour the seat of Derby North? Amidst the slew of bad results for the Labour party on election night was the loss of Derby North by just 41 votes. Crunch the numbers and the incumbent, Chris Williamson, missed out on re-election by a margin of just 0.09 per cent of the vote – that’s just under one vote for every 1,000 cast. A bitter pill for him to swallow, I’m sure, but could it have been different? I lodged a Freedom of Information Act request with Derby City Council asking how many postal votes they had received after 10pm on polling day. After that time, of course, votes can no longer be accepted and don’t count. We can’t know how many people turned back en route to the polling station once they realised it had gone 10 o’clock and they were too late to play their part, but we can find out how many unwittingly sent their vote back too late. Poor judgment: that’s the reason UKIP MEP Janice Atkinson has given for referring to a Thai-born supporter as “ting tong from somewhere”. I was “completely tired out”: that’s how Farage explained his statement during the European election campaign that he’d be concerned if Romanians moved in next door. Excuses, excuses. Liberal Democrat MEP Catherine Bearder works harder than nine UKIP MEPs put together. She speaks more sense than their entire delegation, of course, but in terms of turning up to vote, it’s official: the number of European Parliament divisions she’s taken part in since the election is more than the combined total of nine of their lot. So, Mr Farage, which is it? In the debates with Nick Clegg, you claimed 485 million of our fellow Europeans could come to Britain. 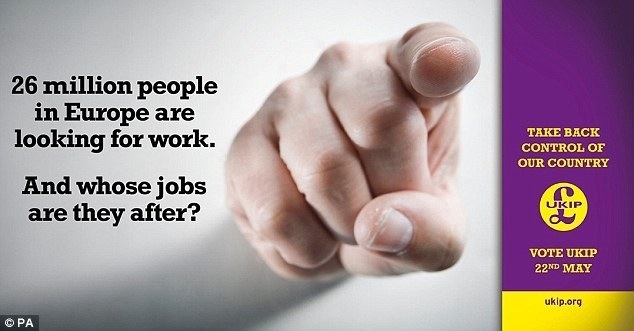 On your wretched billboards, you claimed 26 million are eyeing up our jobs. Now, on leaflets that are dropping through letterboxes, you claim 4,000 EU migrants are landing on our shores each week. These are very different numbers. I guess the 485 million figure is simply the total number of people who could legally come to the UK. But how is this different from pointing out that the 64 million people who live in the UK are all perfectly free to move to, say, Totnes? Should Totnes Town Council leave the UK so it can impose border controls? Should National Rail blow up the railway line at Dawlish to slow their arrival? Should the Government impose restrictions on internal movement within the UK just in case? Of course not, because 64m people aren’t about to move to Totnes, even though they’re free to do so, just as 485 million Europeans are not going to come here to Britain. Opinion: Do people not care about civil liberties? Fear is a powerful motivator. Take, for example, its use in two political campaigns, one from each side of the Atlantic: the Daisy Girl ad, used in the re-election campaign of US president Lyndon Johnson in 1964; and the Labour tax bombshell broadcast, from our own Conservatives in 1992. I’ve just been accused of issuing the dullest tweet of the week. Admittedly, “This week, the European Court of Auditors signed off the #EU’s accounts, as it has done annually since the 2007 financial year” is hardly the most exciting 133 characters ever featured on twitter, but with half-a-billion tweets emerging from the twitter fire hose daily, it was quite a condemnation. But the point I made in that tweet is important. Why? Because this week saw another raft of accusations that – yet again! – the European Court of Auditors has refused to sign off the EU’s accounts. Interviewed by the Sunday Telegraph, Work and Pensions Secretary Iain Duncan Smith urged wealthy pensioners who do not need the universal benefits they receive to hand them back to the State. What he didn’t say in that interview, or at least it isn’t reported, is that pensioners are able currently to inform the Government they do not want to receive, for example, the Winter Fuel Payment (WFP). Some already have, but do you know how many? I got hold of the numbers last week thanks to the Freedom of Information Act. Labour clears the way. So says the century-old Labour campaign poster depicting working men smashing down the door to the House of Lords. Oh dear. Given the opportunity earlier this month to live up to that proud boast they sided instead with rebel, anti-reform Conservatives and together succeeded in forcing the Government to abandon a vote on its proposed timetable for the bill. Without the timetable, those who, for whatever bizarre reason, don’t believe that the governed should elect those who govern them could talk until the cows come home, ensuring the reform bill is killed off. Like many of my fellow Lib Dems I have had steam coming out my ears these last few days after reading over the weekend that the Coalition was considering the mass, unchecked surveillance of the entire population’s emails, telephone calls, texts and tweets, as well as messages sent through Facebook and through games consoles like the Xbox. How many failed the conference security checks? Before conference there were lots of pieces here on Lib Dem Voice about the new security hurdles over which people wanting to attend conference would have to jump. There was the occasional piece defending the new arrangements, but most were pretty hostile. I am not usually one to pick at scabs, but I thought that once the dust had settled on conference season I would ask each of the police forces responsible for security at the three main conferences for some hard numbers. Thanks to the Freedom of Information Act I did just that. I have moaned a lot about those spy cars and vans that patrol our streets, filming us in those brief moments when we’re not being filmed by omnipresent static CCTV cameras. I have even written about them here on Lib Dem Voice. What annoys me in particular is the number of times I have seen them seeming to break the rules they are there to enforce. Take this example from southwest London, highlighted for me by Jason Hunter. These people are exercising power over us, filming us as we go peacefully about our everyday lives. I don’t like at all the idea that they might feel themselves to be above the law. It may to some sound petty, but to me this is important. What I am driving at was summed up recently by Norman Baker in this vox pop interview at the Birmingham conference. Asked about the values of the Lib Dems his first instinctive answer is about ensuring the balance of power between the State and the individual is not too heavily weighted in favour of the State. Spot on. It’s official. Liam Fox is set to receive a severance payout of £17,207 for quitting his post as Defence Secretary, and that hefty wedge is due to drop into his bank account on 30 November. That’s not idle speculation or even what I picked up after reading some newspaper report or other. It’s what a Ministry of Defence official personally confirmed to me yesterday. Opinion: Who will sort out our colossal National Debt? The one group I’d most expect to be drawing up a roadmap to a debt-free Britain would be true-blue Tories. Some of them at least understand the problem. In a new book by five Conservative MPs – After the Coalition: a Conservative Agenda for Britain, dubbed by the Independent as the Bible of the new Tory right wing, there is an entire chapter on the National Debt and the risk it presents. Laws are infringements of an individual’s liberty. Where they exist, they must be justified (and plenty of laws are perfectly justifiable), but those that cannot be justified should be ditched. We have seen some of this work being done by the Coalition – through the Protection of Freedoms Bill and Vince Cable’s Red Tape Challenge (which is set to repeal the wartime Trading with the Enemy Act) – but there is a hidden layer of rules and regulations, much of it petty, obsolete or needless: council bye-laws. We’ve seen and heard from dozens of pundits wheeled out over the last week to explain the riots we saw on the streets of some of England’s cities last week. But here’s an unasked question: did a Coalition minister unwittingly predict these riots with amazing precision, and in doing so offer up an explanation that has not as yet been suggested by any of the experts on our TV screens?